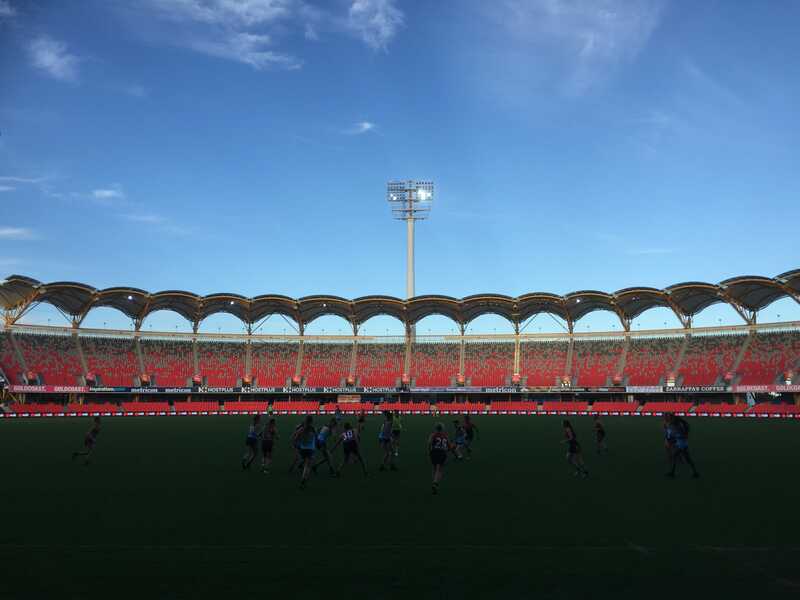 IN an entertaining opening day of AFL Women’s Under 18 Championships on the Gold Coast, Vic Country, Vic Metro and the Eastern Allies came out on top. However, their opponents, Queensland, Western Australia and the Central Allies were exciting to watch and were competitive in patches as they tried to get over the line. Peter Williams and Julia Montesano were there to witness all the action at Metricon Stadium. Heath was like a mosquito on the day, pestering her opponents with her speed and ‘never say die’ attitude. She laid great pressure on the ball carrier when she thought she was in space, which created a contest as numbers flooded to the ball. Her tackling was fierce all day, and she was able to win a free kick at the top of the 50 from her effprts to send Country forward. Heath displayed an excellent second effort when she executed great run and carry after dropping a mark. She created great run down the wing and a scoring opportunity for Country, creating many forward thrusts from her hard work in defence. Harvey played a fantastic game in the forward line, and if it wasn’t for McEvoy’s purple patches, she would’ve been the best forward on the ground. She took a great mark and kicked it well down the line. Also executed an excellent snap around the body, thanks to some great positioning in the forward line. This resulted in her second goal of the day, proving how lively she was inside 50. Harvey led well towards the footy, and provided some X-factor when she spun one way then the other then centered it well towards the middle of the ground. Haeusler had a really solid game in defence, proving to be important on the day for Country. Her clean hands off the deck were outstanding and she used them to effect on multiple occasions. After a clean pick-up, Haeusler was able to spot a one-on-one contest to kick to or kick the ball nicely down the line. She was an agile mover throughout the day and displayed wonderful acceleration down the line. Took a great intercept mark and executed a great fend off, which enabled her to handball it out of trouble. A highlight of her game was when she displayed great hands to send the ball across the goal line, saving a major. Hanks began her day with a great goal on the run to get Country on the board. She stayed forward for most of the game, involving herself in as many contests as she could. Her hands in close were on display, and an excellent fend off and kick down the line made for great viewing. Hanks nicely delivered a kick to Julia Harvey on the lead and followed it up with a great chip kick to Nina Morrison when she saw no other option down the line, which demonstrated her elite kicking on the day. When she went back into the midfield temporarily, she had an immediate impact, as she hacked it out of the middle of the ground which resulted in Lucy McEvoy running into a goal. Purcell got plenty of the ball on the day, playing a lively game through the midfield. She delivered a good handball to reach the player behind her and displayed excellent quick hands out of the contest. Purcell lowered her eyes on many occasions and found the right option rather than hacking it clear, showing her composure in the contest. Van De Heuvel was lively for Country throughout the day. She was able to pick up the ball off the deck and execute quick hands to get the ball out of trouble quickly. Her hands in general were great all day, allowing for quick transition throughout the afternoon. A highlight of her game was when she used brilliant acceleration to lay a great run-down tackle, earning her a set shot on goal. Nina Morrison was the star of the side on the day, displaying exciting run and outstanding hands throughout the day. She took a great contested mark and executed those signature quick hands on the wing, beginning with a bang. She then executed a good pick up off the deck and fired off a handball to keep the play flowing for her side. Morrison also did well to prevent a mark thanks to her gut-running to involve herself in the one-on-one contest. She was then able to centre it back towards the goal square, creating a forward play for Country. Morrison simply played out of her skin, getting plenty of the ball and demonstrating an incredible work rate. Delivered a magnificent kick into the forward line that rolled through the goals, capping off her great day with a reward in front of the big sticks. Executed an excellent fend off and a great handball forward. She showed great composure as she always does the on last line of defence. This was shown when she executed a good pick up off the deck and used nice body work to evade her opponent. I thought Allen did well to act as a second hand in defence and a solid link in the chain on the day. Taylor laid a fantastic tackle to stop her opponent in her tracks and win the free kick, starting off her nice day in defence. She delivered a nice long kick into space and followed it up with a great pick up off the deck, hacking into space. Taylor was able to read the play and the situation well, and was courageous in the back line. This was shown when she took a great mark with an opponent coming hard at her. Took a good mark off a Shelley Heath free kick and displayed a nice kicking action towards goal that just missed on distance. Shannon also chased the ball hard down the line and flicked the ball on well at ground level, demonstrating a high footy IQ. Caris was solid in the ruck and shouldered most of the duties throughout the day. She also displayed good hands at the contests, delivering some nice handballs into space. She is an absolute work horse in the ruck and barely took a rest on the day. Executed fantastic run and carry through a bunch of opponents in the middle of the ground to create the one-two with Nina Morrison, which ultimately resulted in a forward entry for Country. Webster continued to create opportunities thanks to her ability to rack up plenty of the ball. She displayed great acceleration to hunt the ball down and centered it well with a booming kick in the middle of the ground. She was exceptional all day. McEvoy was the star of the day for Country, booting through five goals for the match. Her first goal came from a great contested mark, which put Country 15 points in front. Also provided a highlight when she executed an excellent pick up off the deck followed up by a great spin around her opponent on the boundary line. McEvoy proved to be the excitement machine when she kicked three goals in two minutes late in the second quarter, which pretty much sealed the win for Country even at that point in the game. Her marking was outstanding throughout the day. Whether she was on the lead or in a contested situation, it was more than likely that she would take it. On the goal line, McEvoy snatched the ball from the opposition to kick her fourth major of the day, and followed this up with some excellent positioning work to kick her fifth. You just knew it was her day when she celebrated before the ball went through the goals! Took a great mark from a kick in down the line and contested well throughout the day. Followed this up with a good intercept mark and an excellent handball under pressure. She displayed excellent pressure in the one on one contest to keep the ball in play, tackled her player and won a free kick for it. Using it well as always, Jones delivered a great kick to Sophie Van De Huevel in the forward line, spotting up a great option. Really impressed with her game through the midfield. She has that good balance of offense and defence with the way she goes about her football. Postlethwaite has clean hands at ground level or in the air, shows good vision in the way she is able to handpass into space to her teammates, and has a neat sidestep she uses to evade an oncoming tackler. She also lays tackles herself and leads by example. She worked well on the inside and outside, kicking inside 50 to advantage on a number of occasions. Queensland’s best for mine because of her ability to show relentless work rate and tackling pressure. Farquharson lead up to the ball on countless times, reading the play well when she noticed her midfielders were about to win the clearance. She laid some strong tackles and was smart when she went into the middle. Farquharson’s strong run-down tackle at half-forward in the second half to win a free was indicative of the effort she showed throughout the match. She also has a handy vertical leap, taking a strong grab in the final term, just missing the set shot. A really hard runner who laid a fantastic tackle on Nina Morrison in the second term to win a free. She just continued to run and put her hand up as an option on the outside. Dawes also dives in and is not afraid to win the hard ball as well. Covered ground really well and was one of Queensland’s more prominent ball winners. She laid a number of strong tackles and won a free for a push in the back in midfield and kicked neatly inside 50. She reads the taps well at stoppages and has a good closing speed which helps in marking contests and in congestion. Had a really big third term, laying a bump on Shelley Heath and winning the footy on the wing, then laid a great tackle in defence to lock up the ball after it was knocked down in a marking contest on the last line. Randall showed good vision to handball into space over a long distance. One of Western Australia’s best, Hampson showed great intent in defence and pushing up the ground when required. She set the tone for a great run-down tackle in the opening minutes as Country ran in to score, forcing a behind. Hampson has a penetrating kick and is strong overhead, with good vision. She attacked the ball at speed and had the smarts to quickly give the ball off to Lily Postlethwaite for her to kick long inside 50. A really promising player off half-back. Started strongly up forward, using good positioning to pounce on a loose ball and snap truly for Queensland. She came off for a break, and almost instantly won the footy upon return, having a long kick to the goal square which just missed. The ball did not go down there as much later in the game, but she presented well and had a lovely kick inside 50 in the third quarter. Started the game really strongly, taking a mark against the flight on the wing in the opening term. She won a free kick inside 50 for holding but her shot on goal just missed. She showed off her good agility and speed to lay some strong tackles through the middle and up forward. Grider was not afraid to go in hard through the midfield. Eller lead up at the football well early and won a free for in the back. She was clean at ground level and kicked the ball to a dangerous area inside 50. A strong player across the ground, winning possessions through defence and midfield. She stood up in a tackle and was able to kick the ball to midfield, and then without the pill she lead hard and took a strong mark on the lead and dished off to Hayley Moore. An early snap on goal in the third term just missed, but she was lively inside 50. She produced a great kick on the move to Zimmorlei Farquharson who dragged down a big grab. A smart player who had a good tap at ground level when she knew she could not take possession cleanly, and won a free for in the back for the effort. Ahwang took a good intercept mark inside the attacking 50. One of Queensland’s best, starting like a house on fire, shrugging off a tackle in defence and showing polish to deliver cleanly. She had a great balance of offensive and defensive qualities, laying a few good tackles, while creating dash out of defence. Farrar was clean throughout the match and was a lovely kick of the football under pressure. She used her hands to advantage and on the final siren took a terrific intercept mark and kicked forward. A strong and clever ruck, she had a good battle with Rene Caris. She palmed down to her midfielders well and then sometimes cleared the zones with big thumps. She turned it on as the game went on. As usual, Prespakis got plenty of the ball on the day and while she did not provide real X-factor, she was still her talented self. Executed an excellent take on the boundary line and accelerated wonderfully towards her forward end of the ground, which set up a forward opportunity for Metro. Showed great acceleration again when she burst out of a contest and delivered a lovely kick into the forward 50, presenting hard up forward throughout the day. Made her way into the game as each quarter progressed, ending up being the leading disposal-getter for Metro. As always, Cann displayed good hands throughout the day and delivered a good handball under pressure. She always fought hard for the footy and her good handballing often provided a good link in the chain. Cann was particularly explosive out of stoppages, helping Metro get forward on multiple occasions. Patrikios was solid all day and provided excitement when she got the ball in hand. In one instance, she spoiled the ball well which saved a certain Western Australia goal. Also displayed excellent acceleration and delivered a lovely kick into the forward line, backing it up with excellent running in the forward line. In this instance, she ran behind Mikala Cann to run into goal but just missed. Despite this, her trademark side step was on show, which is always exciting to watch. Patrikios delivered a great kick into the forward line and displayed excellent run and carry. As usual, Bateman was as lively as ever up forward, creating plenty of chances and converting two majors herself. For her first goal, she read the ball well when it ricocheted off a teammate’s head to kick Metro’s second of the day. Bateman positioned herself well in the forward line and put herself in prime spots to kick majors. A highlight of her game was when she executed a strong tackle to win a holding the ball free kick and then delivered a great centering ball. Brancatisano worked hard in the midfield and used her strengths to her advantage throughout the day. Executed a great burst of acceleration after a wonderful pick up of the footy following a smother. Followed this up with great strength to battle through a tackle and displayed good hard ball gets in general. Also delivered a good handball that allowed Georgia Patrikios to stream forward, demonstrating her clean hands on the inside. Warburton delivered a good chip kick off the ground to get it forward and did well when she cleverly stopped the ball with her foot. Took a great mark in the back line and followed it up with a second effort to get the ball out of an opponent’s hands who she nearly turned it over to, showing her intent to back up her efforts throughout the day. Took an amazing contested mark running back with the flight of the ball, which was undoubtedly the highlight of her game. Grant collided with her player side on, then saw that nobody was on the mark and streamed forward with a long kick. Also displayed clean hands when she delivered a good handball to release Georgia Patrikios on the outside. Grant’s run and carry out of defence was exciting and excellent throughout the day. Started off her day when she dived across the goal line to save a certain goal for Western Australia. Also executed a great fend off as well as excellent run and carry in defence. McLaren showed her agility in the back line throughout the day, proving to be a handy player for Metro. Took a great intercept mark in the back line and was generally solid as always in defence. Made a rare cameo up forward when she kicked an excellent goal off the back of the pack. She also did well to come to the footy rather than waiting for it, creating opportunities for Metro. McKay was a handy player for Metro, working hard in the midfield. She delivered a nice long kick down the line, and her kicking in general was quite good. She emerged wonderfully out of the pack to kick a snap from boundary line, showing sheer acceleration. Although she just missed, it fell into the hands of Gabby Newton. Newton was one of the leading disposal-getters on the day, finding the ball wherever she went. She ran well throughout the day and her hands and kicking were marvellous as usual. When she went up forward, she missed an easy shot but followed with a goal, displaying good intent to keep going until she gets the reward. Ended up with two majors for the day in a great all-round game. Newton also moved well throughout the day and evaded her opponents with effect. Lynch’s hands were solid as usual for Metro and she created opportunities in almost every instance when she got the ball. Executed a great fend off to free the ball from pressure and get it forward. She then followed this up with a good mark inside 50 for a set shot chance. She always got the ball in different areas on the ground, displaying wonderful endurance and her willingness to win the footy. Kicked a great goal on the siren to get the energy up for Metro. Gutknecht also executed a great handball while being tackled and did really well to fend off a couple of players and aim for a snap at goal. She was quite lively when she got the ball in hand. Szigeti provided a good link in the chain in the back line, as she was always ready to mop up the ball when her side was in trouble. Continually applied great pressure on her opponent and kept feet while she on the ground, which was crucial in that instance. Also took some great one on one marks on the day. One of the most impressive West Australians through the midfield, she was fierce, but also clean, and showed great closing speed. She covered ground really well, winning the ball in all thirds of the ground and laid a number of big tackles on Metro forwards Georgia Patrikios and Daisy Bateman, who are both very agile. A nice kick of the football, Bowen fought hard at the coal face to win the contested ball as well. Finished with one major – coming in the last quarter and was lively up forward. She showed good pace along the wing and was able to execute quick handballs at half-back, covering the ground well. A really lively type, she caused headaches up forward for the Metro defence, having an early snap on goal which was spoiled on the last line by Hannah McLaren. In the second term she had a great shot on goal from long range, and also had a clean pick-up off the deck to kick forward. Provided good run between midfield and half-forward. One of West Australia’s top prospects on the day, Sergeant was clean with ball in hand and provided great rebound out of the back half. She had a nice sidestep around an opponent in the third term to handball clear to a running teammate. In the final term she clunked a mark on the wing and kicked forward, then took another on the defensive 50 but her kick went a little too wide and was out on the full. A strong tackler on the day. Played more of a defensive role on the likes of Britney Gutknecht and Daisy Bateman, and matched them one-on-one in the contest. She managed to win more of the football in the second half, winning a couple of crucial one-on-ones including one in the final term. 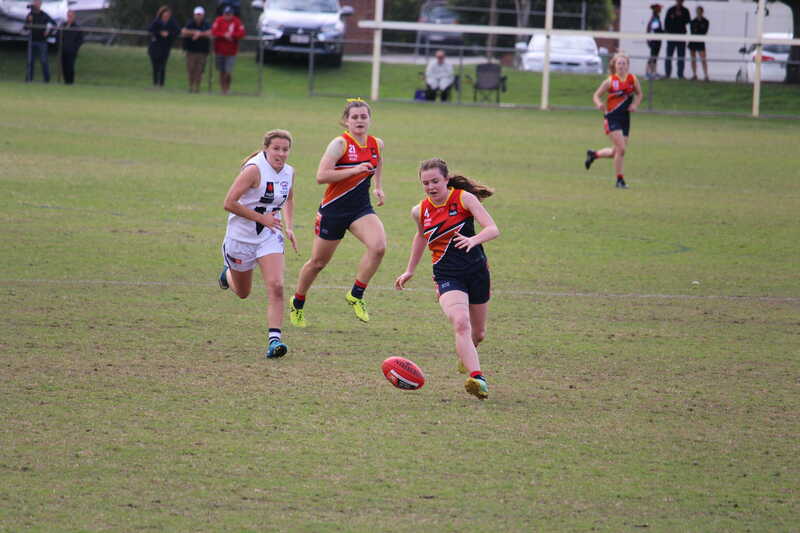 She won a free for push in the back and then produced an elite kick to the wing which cleared the zone, found a teammate perfectly and she delivered inside 50 which lead to a Mikayla Hyde goal. Really busy in the first half and just continued to win the football throughout the four quarters. Clean, fast and courageous, Carling sometimes rushed her kicks going forward, but her intent and acceleration was impressive. She kicked to Roxanne Roux’s advantage on the half-time siren resulting in a goal, and after copping a knock in the third term, came back on and still laid some strong tackles. Kicked Western Australia’s first goal of the game by pouncing on a loose ball and nailing the goal under pressure from all sides deep in attack. 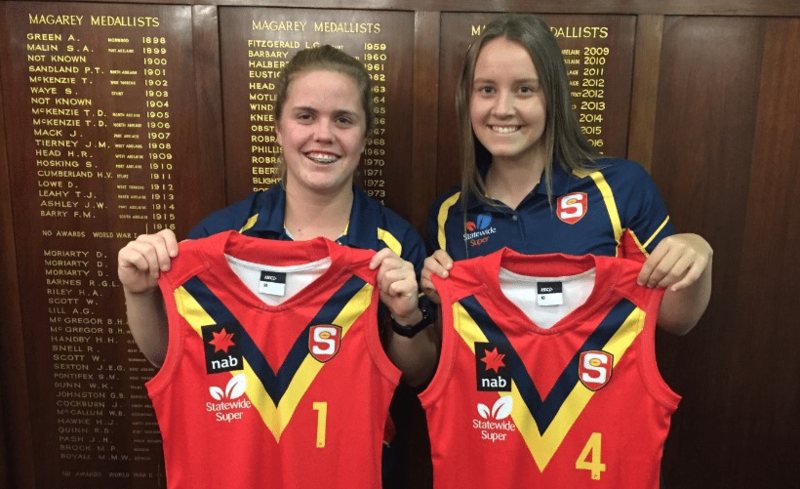 A star on the day, the top-age AFL Women’s Academy member was the most consistent West Australian in the match. She set the tone with a strong tackle on Emerson Woods on the wing, which allowed Sabreena Duffy to take it away. She produced a nice clearance in the second term and gave it to Roxanne Roux on a silver platter and then in turn to Kate Bartlett who converted. A thumping kick, good in traffic and able to intercept behind the ball as well, Dowrick is a really versatile player. A fierce attack on the ball, she played through the middle and consistently added pressure into the team. She slowed down opposition defenders from clearing the zone in the second term and took a great intercept mark at half-back later on. A shot on goal in the final term form long range but it missed to the left. A really impressive game up forward, the overager reads the play well and leads hard at the football. She just clunks marks with Velcro-like hands and also forces turnovers through her run-down tackles. She started the third term on fire, leading up, receiving the handball, going one way and then the other and snapping towards goal with great goal sense and agility. Finished the game with two majors and was the clear standout forward in the match. For a taller player, Dorizzi has great closing speed and is versatile in the way she plays. She can win the ball in the air or at ground level, and is often decisive in the way she palms the ball down. She had a set shot on goal on the three quarter time siren but it hit the post. Really impressive game with some highlight-reel worthy moments. The first was a huge bone-crunching tackle at half-back to win a free and kick long. Then she took a massive grab, clunking the mark with a big vertical leap and hit-up Caitlin Hill up forward. Another tackle late in the second term forced a turnover and she had a shot on goal in the last quarter but it went too far to the right. Finishing off a terrific game, Roux laid a huge tackle on Marnie Jarvis to stop her running into goal, and then Katie Lynch at half-forward, rewarding the West Australian with a free. Hill continued to lead up at the football throughout the game and took a number of strong marks. While she did not manage a major in the game, she had a number of opportunities, although had a strange lead-up, swaying the ball a bit side to side, with her set shot hitting the post. A standout performer and one of the top players on the day. Through the midfield she was everywhere and her clear class shone through in the match. Parker is rarely worried out of it or rushed, she just glides out of congestion with ease, which was shown in the second term when she was in between four players and just worked her way out of it with a quick glide, then had a shot on goal which just fell short. She had a couple of other chances in the game but could not quite convert, but her work rate and ability to impact the contest was evident. The match winner in the end, Doyle capped off her performance with two goals in the last term and just put the game beyond reach for the Central Allies. All three goals came from opportunistic moments and Doyle has a great goal sense and ability to pounce when required. A great dribble goal to seal the game was a highlight. Was solid up forward across the game but hurt the opposition on the scoreboard in the final term, kicking a vital goal. Moments earlier she missed a set shot after taking a good mark, but made no mistake with her second attempt. A really good defensive pressure player, she was able to work hard one-on-one and provided a good spoil on the wing pushing up the ground. She also laid some strong tackles and was constantly involved with pressure plays. Kicked a great goal in the second term and was among the best across the four quarters, providing an option by leading up and getting involved in the play. One of a number of versatile Eastern Allies players who contributed to the win. Started in defence and took a good mark at half-back and used her raking kick to hit-up a target on the wing. Moments later she was on the receiving end of a free kick inside 50, with her shot on goal just missing. She had a couple more opportunities but could not quite make them count, spraying one out on the full and the other just missing when it came off the side of her boot. Was still clearly in the Eastern Allies’ best and was always involved in the play. A great smother in attack late in the game was indicative of her intent on the day. Strong overhead and at ground level, she laid some good tackles and took good grabs in space. Haines’ second efforts were impressive and she covered the ground well and was another player who was versatile in where she could play and impact the contest. Just had a few impressive moments throughout the game, particularly in the first half. Mitchell showed good hands in passing quickly to teammates and also great strength, producing a good fend-off in the opening half. Just buzzed around and was a solid contributor in the win. Worked hard to win the footy throughout the day. Showed tenacity and intent to win the footy and when it didn’t work out for her, she kept trying. Never gave up for the Central Allies on the day and did well defensively, laying some great tackles. Executed great run and carry down the line and showed sheer speed throughout the day. Took a good mark in defence but also made an impact in other areas of the ground. She was simply in everything and put a lot of pressure on the ball carrier. Gore was an important player for the Central Allies, doing all the little things to ensure her side stayed in the hunt. Laid some good tackles on the day and delivered some nice kicks into space to get the ball out of trouble. In one instance, she laid an excellent run down tackle to shut down an opponent, displaying excellent closing speed. Also took a good mark and followed this up with some great run and carry down the line. Moreen is an excitement machine and was responsible for two of the Central Allies’ goals. She converted her side’s first major of the day when she got a free kick and converted the set shot. Her run and carry was also exciting as it created opportunities for her side to stream forward. Rosenzweig was one of the Central Allies’ best players on the day thanks to a lively performance up forward. Executed a great pick up and quick kick and took many good marks in the in the forward line. Kicked the ball well around her body to get it forward, creating many forward thrusts for her side. A highlight of her day was when she trapped the ball magnificently and did nicely to get up and kick around the body for her second goal of the day. McKinnon’s hands were the best of the day for the Central Allies. McKinnon always managed to position herself well and took some memorable grabs. Did well in a contested situation and a one on one situation, showing her versatility. Also displayed great kicking, demonstrated when she delivered a nice high kick out of the contest. Boles was huge for the Central Allies, doing everything she could to win the ball. She ran hard to every contest that she was involved in to try and win the footy. Delivered a nice kick to the top of the square and her kicks in general were sound and precise. A highlight of her game was when she took a great one hand grab and executed a great clearing kick from a stoppage. EASTERN Allies have started the AFL Women’s Under 18s Championships off with a good win over Central Allies on the back of a three goals to zero final term. Lillian Doyle was the inspiration in the last term, nailing two majors and three for the game, while Alyce Parker was superb through midfield. The Central Allies started strongly as Parker won the opening two clearances. She led the team through the midfield and her work ended up leading to a goal on the board in the opening couple of minutes courtesy of a great snap which saw a tussle in the goal square and a goal to Brea Quinlivan. 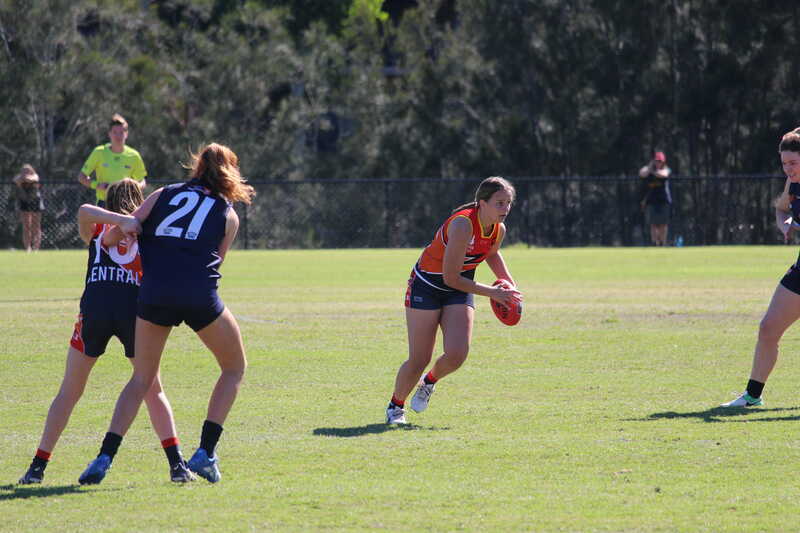 Chloe Haines‘ ability to cover the ground was evident early on, taking an intercept mark at half-back, then finding herself on the receiving end of a free kick down forward. Her set shot just missed, but Eastern Allies were doing all the attacking. Running into another open goal, Hannah Munyard stopped her in her tracks. Doyle then made it two with a goal on the line courtesy of a great opportune kick. Then in one of the Central Allies’ first opportunities, dominant goal kicker, Katelyn Rosenzweig stepped up for a strong mark, but her set shot faded. South Australian captain Esther Boles was battling away, continually cracking in hard. The quarter came to an abrupt end after the scoreboard clock did not start for some time and quarter time siren sounded just five and a half minutes in to the term with Eastern Allies leading by 11 points. The second term started with a couple of shots on goal to the Eastern Allies including a snap from Alyce Parker off the deck. It resulted in a behind, and then the work of Arthurina Moreen off half-back to clear by breaking the lines was impressive. Parker’s work through congestion was very eye-catching, managing to remain calm under pressure and somehow got out of a stoppage with four opposition players surrounding her. A subsequent shot on goal fell short, as did Chloe Haines’ snap which went out on the full and then dribbled a behind shortly after. All the play was up the Eastern Allies’ end but they were not capitalising on their chances. Then Brianna McFarlane did capitalise, with a flying shot on goal that managed to bounce through before a desperate defender could touch it. Rosenzweig had a chance to get on the board for Central Allies late in the quarter but her shot drifted wide for another behind. Then a kick forward put it to the advantage of Moreen who won a free kick then converted the set shot perfectly. It was the last meaningful disposal of the game, with Moreen dragging her team back to within 13 points at the main break. Central Allies’ star Nikki Gore had a strong second term, lifting up and maintaining intensity across the term. McFarlane started the third term how she left off in the second term, having a shot on goal. It dropped short, but Eastern Allies were still pushing hard early in the opening couple of minutes. Jemima Wrigley produced a good tackle to dispossess her opponent and have a shot on goal, but it too just fell short. Doyle had a shot for her second but it also just missed. Boles and Montanna McKinnon were working hard on the wing to make something happen, but the strength of the Eastern Allies defence repelled their efforts. Madeline Gault was having a nice patch in the third term, going in hard and winning some possessions through hard running. Parker had a spell on the bench then immediately had an impact upon return late in the quarter, taking a strong mark on the lead and having a set shot from long range. It was just touched on the line and brought down. Gore continued to have the ball on a string, running hard and dropping back into defence to help out her defenders. Jaimi Tabb had a rare inside 50 for the Central Allies, but once again Eastern Allies’ defence was up to the task. Gore’s fierce tackling was on show on the wing and she was beginning to have a massive influence on the game and her efforts led to Rosenzweig pounced with the final kick of the third quarter to add a bit of spice to the final term. The final term continued as had been the game so far with Eastern Allies taking control early. Doyle pounced on a loose ball and ran into goal kicking a major. McKinnon was strong in the opening minutes, taking a powerful mark at half-back, while Gault was busy in midfield. But Eastern Allies’ relentless attack on the ball was starting to pay dividends on the scoreboard, with Zoe Hurrell kicking a great goal on the run. Then Doyle made it two for the term and three for the game, with a great dribble goal for Eastern Allies’ sixth of the game. But not to lie down without a fight, a long kick inside 50 found Rosenzweig. Unfortunately her shot missed, but Central Allies were beginning to even out the contest in the quarter. It would not be enough though, held goalless in the final term, going down 6.8 (44) to 2.4 (16). Gore, Rosenzweig and Boles were clear standouts for the Central Allies. EASTERN ALLIES: Lillian Doyle 3, Zoe Hurrell, Brea Quinlivan, Brianna McFarlane. CENTRAL ALLIES: Arthurina Moreen, Katelyn Rosenzweig. EASTERN ALLIES: Lillian Doyle, Alyce Parker, Chloe Haines, Zoe HurRell, Brianna McFarlane. CENTRAL ALLIES: Nikki Gore, Katelyn Rosenzweig, Esther Boles, Montana McKinnon, Arthurina Moreen. 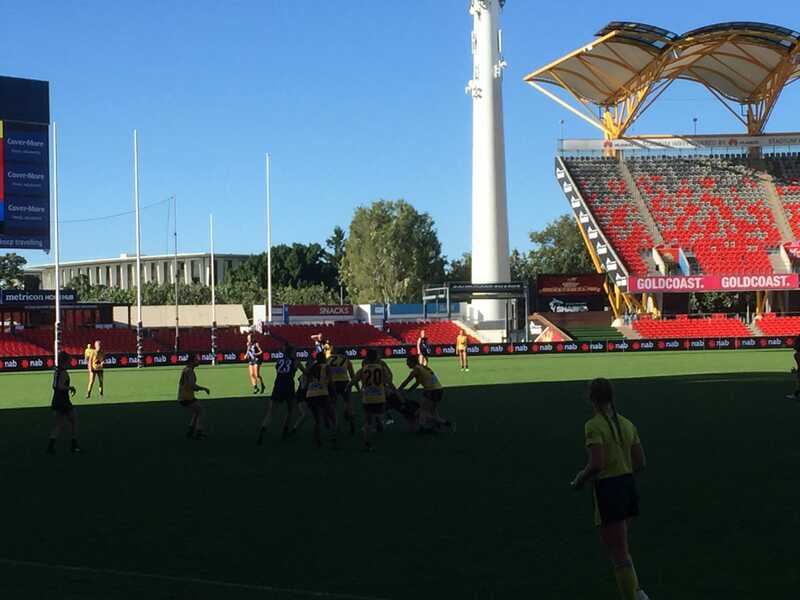 SOUTH Australia has kicked off its 2018 National AFL Women’s Under 18 Championships in style with back-to-back wins over Northern Territory. The two-game series is the first stage of the National Championships, with South Australia and Northern Territory to combine to form the Central Allies. The Central Allies will play three matches against other states – including a composite NSW/ACT and Tasmanian side called the Eastern Allies – when they converge on the Gold Coast in July over a week-long series. In the first game on Friday night, South Australia got the job done despite being inaccurate in front of the big sticks, booting nine goals from 22 scoring shots, to record a 29-point victory over Northern Territory. The second match on Sunday was much more prolific, as the visitors piled on 10.9 to one behind to run away 68-point victors. Nikki Gore was named South Australia’s best across the two games, just ahead of Rachelle Martin who both featured in the top three players in both matches. Up forward, Katelyn Rosenweig showed she will be a force to be reckoned with at the championships, booting six goals across the weekend, while Kiana Lee finished with three. Captain Esther Boles booted a goal in each match. Rachel Dunstan was named the South Australian vice-captain. 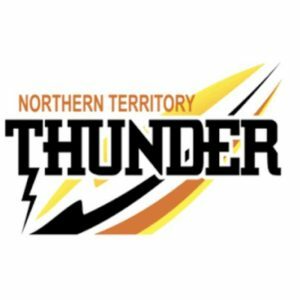 For Northern Territory, the Thunder only trailed by two goals at half-time courtesy of a strong first half with Bella Clarke booting two majors from the home sides’ four goals. By full-time, Tayla Hart-Aluni and Arthurina Moreen had joined her on two majors, with a goal in each half. The visitors kicked away in the second half, but the home side had shown they were more than capable of matching it with them. The Sunday game was less even, with the Thunder managing just the one behind, but Hart-Aluni and Stephanie Williams were again among the best. Tabitha May was deemed the Northern Territory’s Most Valuable Player (MVP) across the two games. SA: Katelyn Rosenzweig 3, Bella Smith, Esther Boles, Kiana Lee, Maddi Newman, Madisyn Freeman, Teah Charlton. NT: Tayla Hart-Aluni 2, Bella Clarke 2, Arthurina Moreen 2. SA: Katelyn Rosenzweig 3, Abbie Ballard, Kiana Lee 2, Bella Smith, Esther Boles, Kimberley Fry. The Central Allies’ first match is against the Eastern Allies on July 9 at Metricon Stadium, before clashes with Vic Country at Broadbeach on July 11, and Vic Metro at Bond University on July 13.